Passengers are urged to check before they travel this weekend, as buses replace trains between Seaford and Lewes Railway Station for 10 days, as major resignalling work takes place along the line. Over the weekend of Saturday 18th August, and Sunday 19th August 2018, and for the week after that, rail replacement bus services will replace trains along the line due to signalling upgrades and engineering work at Lewes and Newhaven Harbour. Both Rail Replacement bus services and local bus services are expected to be incredibly busy over the weekend of Saturday 18th and Sunday 19th August because of the airshow at Eastbourne. Brighton and Hove Albion will also be playing at the Amex this Sunday, putting even more pressure on the railway and rail replacement bus services from Seaford to Lewes. Engineering work taking place will see a new siding / turnback facility which will help to ease congestion when the Brighton Mainline is shut or blocked between Brighton and Keymer Junction. Diverted trains will be able to use the new siding to reverse in, instead of reversing on the main line at Lewes, blocking services from coming and leaving. 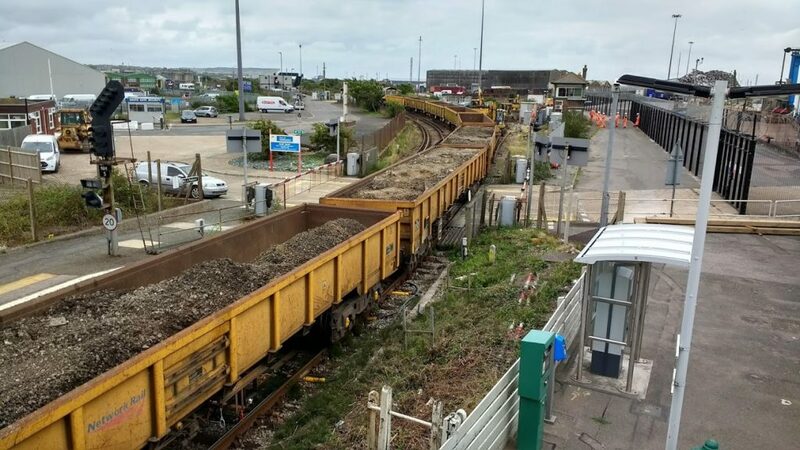 Newhaven Marine and Newhaven Harbour are also being upgraded for potential future freight flow to Newhaven for an marine dredged aggregates and importation wharf batching facility, where the products and materials will be shipped by rail. Visit Southern Railway’s website for further information and planned services during the Lewes – Seaford blockade. You can view live train times here at Rail Record.